Before you bring your new baby home, there are a lot of things you have to think about! Baby proofing your home is very important; while it may be perfectly safe for adults and older children, there are so many aspects of a home that can be a huge safety hazard to a baby! 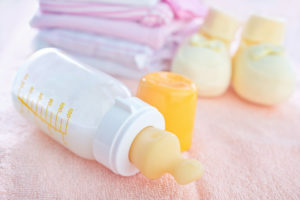 Unfortunately, even if you try your best to baby proof your home before bringing home your new baby, you’ll probably soon discover that there are many hazards you didn’t even think of. For example, when your baby becomes mobile, which happens very early on, you have to be very aware of everything. Babies quickly learn that they can play with anything within reach, and it’s not hard for them to swipe a small object which will in turn become a choking hazard. You’ll have to always be watching out for small hazards. One thing you can do, that might make you feel a little silly at first, is to get down on your hands and knees so that you can see everything from your baby’s perspective. You might be surprised at just how many things you missed by not doing this! Remember that your child is very delicate when they are that young, and things like exposed bolts and sharp corners can be a big injury hazard. Also, don’t forget that little pieces of dust and dirt that might seem insignificant are things that your baby is going to try to put into their mouth. Once you’ve gone from room to room from your baby’s perspective you can then start going for all of the obvious areas. Here is a list of areas of your house and things you will want to keep an eye out for when baby proofing your home. Secure your refrigerator and stove — These appliances can be secured to the wall using L-brackets. Ever year hundreds of children are seriously injured by tipping appliances over, and you should make sure that this is not possible. Also, most oven doors swing outwards and down, almost certainly ending up with your child falling backwards if they attempt to pull themselves up by the oven door handle. You can put one of the many available oven door latches on your oven to make sure that this doesn’t happen. Dishwashers — Most dishwashers these days are unfortunately very easy for a toddler to open. When they watch you open it up every day, they quickly learn how to do it, too! There are many obvious hazards inside of a dishwasher, from extremely hot parts to sharp knives, and you’ll want to make sure that your child can’t possibly get into the dishwasher when you’re not paying attention. Furthermore, the door of the dishwaser exposes your child to the same hazard that the oven door does; if they open it, they will probably fall backwards due to how it opens. You can use the same oven latches on the dishwasher to make sure that they can’t get it open. Dishwasher detergents — Many dishwasher detergents available are caustic and can cause great harm if exposed to skin or swallowed. Always keep these detergents out of reach of your child at all times. Lock up cabinets — You probably store harsh cleaning chemicals in the cabinet under your sink, and you wouldn’t want your baby getting into them. You wouldn’t want them getting into drawers with sharp cutlery or glassware that could possibly break, either. Garbage — While most of us wouldn’t think of digging through the trash, it’s a very curious place for young children. Your trash bin should be secured and impossible for your child to get into. You should also make sure that a toddler won’t be able to grab onto the garbage container and accidentally pull it onto themselves. Table cloths — Table cloths can be very dangerous to children, because they tend to hang down just in your child’s reach. You should remove the table cloth completely when your baby is of an age where they’re crawling or toddling around the kitchen. When you do finally put the table cloth back on, I would recommend putting nothing on top of it at first, just to be safe. Plastic wrap & foil boxes — The boxes that our plastic wrap and foil comes in have a serated edge that is used to tear a sheet off. Unfortunately, these edges can be very dangerous to children and should be disposed off immediately and always kept out of their reach. Plastic wrap and bags — Any kind of plastic can be a suffocation hazard to a curious baby. Never leave any plastic laying around, and dispose of garbage plastic immediately. Beware of mopping buckets — Mopping buckets that are left lying around the kitchen can easily turn into drowning hazards, so always make sure that you dump them out and put them away when you’re done with them. 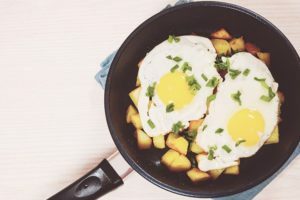 Be careful when cooking — If you’re going to cook in the kitchen while holding your baby either in your arms or using a carrier, be extremely careful. You should never cook with grease when holding your baby, ever. Put them in a playpen or high chair in a location that you can keep an eye om them where they are out of harm’s way. When using the stove, you should always cook using the back elements whenever possible, and be sure to let everyone else that uses your stove that they should adopt this practice, too. Teach them what “hot” means — When your child is of the age where they begin to understand you, you can teach them what “hot” means. Children are very quick at picking up the word “hot”, even at an early age. Be sure to only use the “hot” word for things that are actually hot; if you use it for all items that they shouldn’t touch, the meaning of the word will be lost on them. There are a lot of hazards in the bathroom, too. From tubs and toilets full of water, to potentially dangerous chemicals and medications, there are many things that can cause harm to a curious child. I would recommend completely keeping your baby out of the bathroom; there are far too many ways for them to injure themselves. Either put a childproof cover over the doorknob and keep it closed at all times, or install a hook-and-eye lock high enough that they can’t reach it. Here are the hazards of the bathroom and what you can do to make it a little less dangerous for your little one. Toilet — Put a toilet seat lock on the toilet and keep the lid down at all times. Most toilet seat covers come with a latch or strap, and that is often a good way to secure the toilet. Unfortunately, there are a lot of hazards associated with the toilet: it is a drowning hazard for children, and the seat itself can be quite the dangerous weapon when it comes slamming down, leading to black eyes, cuts and smashes fingers, etc. Not only that, but children love to flush things down the toilet! While that in itself isn’t dangerous to a child, it can be quite costly if you have to hire a plumper to unclog a stuck toilet drain or have them rescue a lost item! Bath tub — Another drowning hazard. Be sure to always completely drain the bathtub after using it. You might also want to put soft covers over the faucets as these are head-bumping hazards, too. If your child is going to be using the tub, it’s good to put a non-slip mat inside of it, as well. If bathing your baby, NEVER leave them unattended, even for a moment. Cosmetics & medications — If you have a medicine cabinet where you store your medication, you should make sure that it will stay locked. Medications are a great hazard to children, and thousands of children die every year from getting into their parents medications. Also, if you have anything like cosmetics, mouth wash, vitamins or anything else your baby might eat, keep them out of reach. Remember that this also includes vitamins and herbal supplements: even these can be dangerous to children in high doses. Power outlets — All power outlets in the bathroom should be covered, and they should all be GFI (Ground Fault Interrupter) outlets which will automatically shut off in the case of a short. I would strongly recommend having a professional electrician inspect the bathroom to make sure that all of the outlets are using a GFI which is functioning correctly. On another note, this isn’t dangerous to children, but to people of all ages. Razors & other sharp or hot items — Personal products like razors, nail clippers, tweezers and other sharp items are a cutting hazard for exploring children. Also, hot items like curling irons and blowdryers should always be kept out of your child’s reach in order to prevent burns. All bedrooms have a number of child hazards that you might not even think of at first. The best suggestion would be to completely make these rooms off-limits to your children, but that might not always be possible all of the time. If your toddler is awake in the middle of the night, they will probably be in the bedroom with you. Here are the things you’ll want to watch out for when it comes to baby proofing your bedrooms. Night stands — From lamps to radios and clocks, to wired phones and other things with cords, there are a lot of things on your night stand that can prove hazardous to a child. Anything with a cord is a strangulation hazard to a curious baby, and unfortunately, it’s not always possible to keep these out of their reach. You can organize everything with a cord so that it goes to the back of the night stand against the wall. Since plugging too many things into one electrical outlet can result in overloading the system, be sure to use a properly grounded electrical strip. Blind draw cords — Again, these dangling items can pose a strangulation hazard to a child, especially when they become to explore and pull on anything that isn’t nailed down. The draw cords should be fastened above the reach of your child so that there is no way they can get their hands on them. Electrical outlets — Like the outlets in any other room, the outlets in bedrooms should be secured with safety covers. Children are keen on playing with outlets, and all it takes is a key or other small item to be poked into the outlet for electrocution to occur. Wobbly bookcases, TV stands, etc — Any large and unstable item like a lamp, TV stand, book case, etc. can be dangerous if your child knocks it over. If possible, remove the lamps or similar items, and replace them with more stable items. There are a lot of things to be concerned about when baby proofing your home, but as long as you go through the effort to make sure everything is safe and secure, there should be no hazards. It’s very important to properly baby proof, so be sure to give your home a through inspection and always have your eye on the lookout for anything that might be a hazard to a child.